FIFA 18 featured one of the most significant additions to the Ultimate Team palette in recent years in Squad Battles, and the feature has continued to be implemented into the gameplay of the newly-released FIFA 19. With the first iteration of Squad Battles, EA Sports introduced a whole new means of earning both points and packs this year to bolster your ranks – with some added new features for the latest version of the game which came out at the end of September. Goal has your complete guide to Squad Battles in FIFA 19 and how to make the most of the new gameplay features. What are Squad Battles in FIFA 19? First introduced in FIFA 18, Squad Battles sees you take on AI-controlled Ultimate Team squads built by other FIFA players. Each competition lasts a week, with four new matches available to play once each every day (and a couple of extra sets thrown in at 17:00 UK time on Saturday and Sunday). By playing and winning those games, you earn points based on the difficulty level you have selected. The more points you earn relative to other FIFA players competing, the greater the rewards – which consist of packs and coins – you will take home at the end of each week. Some of the squads you will be challenged to beat are created by real-life stars, with Dele Alli’s featuring his own special 99-rated card. What’s new in Squad Battles in FIFA 19? Users will get licensed extras such as Squad Builder Challengers and Online Tournaments in FIFA 19, which will see the inclusion of the new Champions League commentary team of Derek Rae and Lee Dixon. Squad Battles rewards in FIFA 19 are handed out once a week when the competition’s leaderboards are set, and will be released at 1am BST (8pm ET) on Monday/ Sunday. To earn Squad Battles rewards in FIFA 19, users need to head to the single-player tab in FIFA 19 Ultimate Team. Here, there will be an option to claim squad battles rewards which will then lead users to the FIFA 19 Ultimate Team store and open the packs. Predictably, the AI-controlled teams of FIFA 19 have been given a substantial upgrade so it will be harder to score and fool the opposition into conceding certain kinds of goals – and so if you were used to playing Legendary in FIFA 18, this new version of gameplay may be just a little bit tricker. 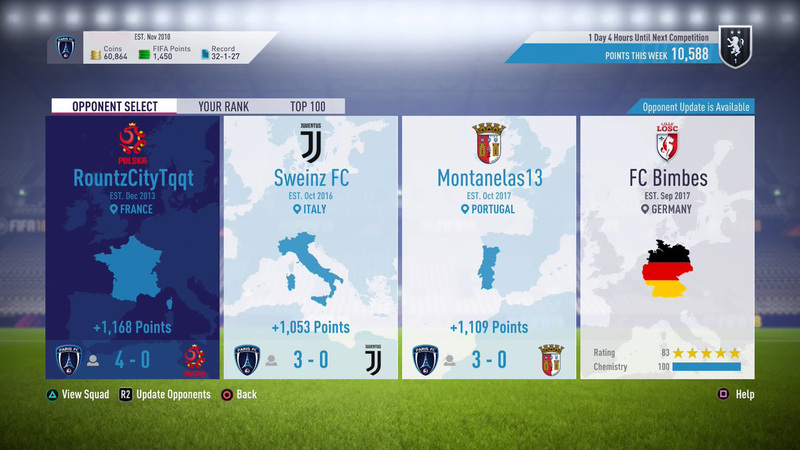 How can I earn points in Squad Battles in FIFA 19? Points are earned in Squad Battles by winning matches. When you are ready to play a match, you will be asked to select a difficulty. Each difficulty has a multiplier assigned to the number of points that can be earned, with the hardest setting – Ultimate – multiplying your potential haul by 2.6 and the lowest – Beginner – halving it (0.5). It is not as simple as three points for a win, though. You will gain and be deducted points depending on a number of stats, including goals scored and conceded, passing accuracy, tackles and fouls. It’s worth weighing up, then, whether you might be able to score enough goals on a lower difficulty to outweigh the advantages of a higher multiplier on a more challenging setting. What are the Squad Battle rewards in FIFA 19? There are special prizes for the top 100 players in the world but after that, each rank is based on the percentage of players you have earned more points than. To get in the highest category outside of the top 100, for example – called Elite 1 – you will need to be in the top one per cent of all players that week. By participating in any way at all, you’ll get in Bronze 3 as a bare minimum and collect a couple of loan players for your trouble. The prizes get better and better as you go up the scale from there, though, and if you can break into the Gold and Elite categories you’ll be landing a decent number of coins and some potentially valuable packs. When are new rewards released for Squad Battles in FIFA 19? Everything starts all over again at 01:00 on Monday mornings. You should see the rewards you’ve earned the previous week become available to claim at that time in Ultimate Team.